Grubby Victorian London? Nope, that’s Chicago, baby! During the four-plus years it took Adam Selzer and I to research and write our book Flickering Empire, we spent a lot of time reading about films that were made in Chicago during the silent era that have since been tragically lost. 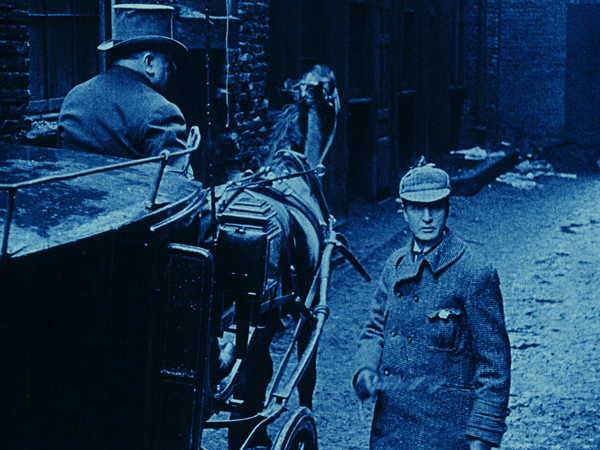 For most of that time, our holy grail of “lost Chicago movies” was the Essanay Film Manufacturing Company’s 1916 production of Sherlock Holmes. The seven-reel feature was, after all, the first feature-length movie centered on Sir Arthur Conan Doyle’s legendary detective-protagonist. More importantly, it was the only record of veteran theatrical actor William Gillette’s acclaimed performance as Holmes, a performance he had perfected on stage after playing it for more than fifteen years with the blessing of Doyle himself; it was Gillette who originated the iconic look of Holmes with deerstalker cap and calabash pipe, props that have become synonymous with the character in the public imagination over the past century. Finally, we knew that the film had been acclaimed by contemporary critics, including the Chicago Tribune‘s Kitty Kelly who wrote, “It is a production to which Essanay may point with pride and may file away in the strong box for future and again future revival.” Unfortunately, it seemed that the Essanay “strong box” hadn’t been strong enough. This should be the local film event of the year. I hope to see you there! This entry was posted on Wednesday, June 3rd, 2015 at 8:59 am	and tagged with Adam Selzer, Arthur Berthelet, Flickering Empire, Sherlock Holmes and posted in Chicago Movies. You can follow any responses to this entry through the RSS 2.0 feed. Glad you enjoyed FURY ROAD, John. You should come to the SHERLOCK HOLMES screening on the 19th. It’s probably the only chance you’ll ever have to see it in 35mm and it’s definitely the only chance you’ll have to see it in the very room where it was shot! This is so exciting. I would be there if I could. Would love to see it. a government insured home loan that permits you to acquire a house without money down. related to home-buying, renovating as well as building homes. host are you the use of? Can I get your associate hyperlink to your host?